I had some fun last week assisting a group of people who are paid to look for animals. On this occasion, they were looking for some of our amphibian friends, the Newts. In England we have three native species: the Smooth, the Palmate and, king of them all, The Great Crested. The Palmate and Smooth measure a tiny 9 cm with the prehistoric looking Great Crested often 15cm in length. These amphibians, whilst not uncommon in England, have been declining throughout Europe due to pollution from agricultural run off and destruction of their natural habitat ponds. Although cute, they are not permitted as pets and all three are protected from trade in the UK under the 1981 Wildlife & Countryside Act. The Great Crested newt is a European protected species, which means it is illegal to harm or disturb either them or their habitat. As a matter of fact, even simple handling is illegal without a license! Furthermore, they are listed as a priority species under the UK’s Biodiversity Action Plan. 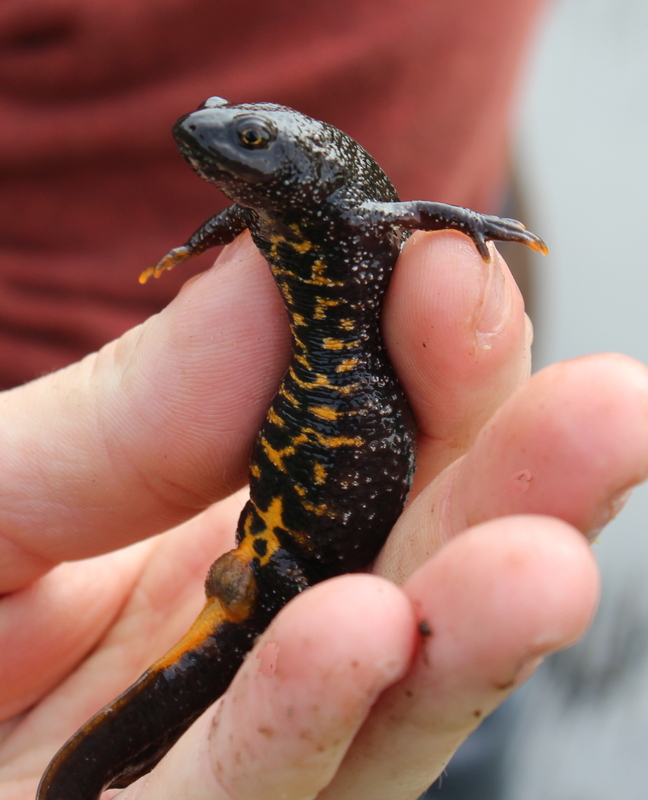 Accordingly, newt surveys are often required as part of development proposals to assess the presence and impact on newt populations as well as potential mitigation measures. This is where the Newt Hunters come in! These people come in all shapes and sizes, some even resemble newts themselves, yet go by the name of ecologists. You may spot them parked up in laybys (let’s not jump to conclusions) or traipsing across fields just before dusk. They are normally found in pairs and are easy to spot as they are usually followed by a herd of sheep and are armed with wellies, huge torches, nets, canes and plastic bottles with inverted heads. So, how do the Newt Hunters know how and where to find the tiny newts? Well, although apparently each species of newt prefers slightly different conditions, in general they tend to like large ponds in spacious areas with plenty of places for them to newt around and hide in. The best ponds are those without many fish as they enjoy feasting on newt eggs and larvae. A healthy level of aquatic vegetation is ideal, providing both cover and egg laying locations. More specifically to the single species, Palmate newts seem to prefer shallow ponds with more acidic water and so are often found in upland areas. Great crested newts, on the other hand, prefer the nicer and more idyllic ponds, the sort you find on postcards with a pristine undisturbed environment allowing for good invertebrate foraging and hibernation. The Great Crested are definitely the more upper class newts! Their cousins on the other hand, the Common newts, are significantly less fussy and quite happy to share their pond with a shopping trolley and discarded car exhaust. But above all this, the main thing they all require is an exposed area in the ponds to perform their mysterious mating dance. This is a rare spectacle which is rumoured to involve some exotic and seductive tail wagging as part of an enchanting dance. Only a few of the Newters have ever witnessed such an event and so the line between fact and fiction is easily blurred. • Bottle trapping: submerged bottle traps are placed around the pond perimeter at dusk and checked the following morning. As the newts have just recently returned from hibernating in nearby logs and foliage, they are not yet in full mating colours. So the two newts we found in the bottle traps (both Palmates) had not yet changed into their spring colours but, were both very cute nonetheless. I snapped a good picture of a female which I named Paloma, who kindly posed for a couple of seconds before heading back off to her business. Once the survey was complete, the canes and bottles were removed and packed away, leaving the pond as it was found; deceptively quiet as if no humans had ever waded into those waters.